Senate Republicans on Wednesday blocked legislation aimed at letting people refinance their student loans at lower rates, a pre-ordained outcome that gave Democrats a fresh election-year talking point against the GOP. The 56-38 vote fell short of the 60 that would have been needed to advance to debate on the measure by Sen. Elizabeth Warren, D-Mass. Her bill would have let millions of borrowers, some with years-old debt and interest rates topping 7 percent or more, refinance at today's lower rates. The bill would have been paid for with the so-called Buffett Rule, which sets minimum tax rates for people making over $1 million. "With this vote we show the American people who we work for in the United States Senate: billionaires or students," said Warren. "A vote on this legislation is a vote to give millions of young people a fair shot at building their future." Republicans said the bill wouldn't have done anything to lower education costs or reduce borrowing, and they accused Democrats of playing politics by highlighting an issue that was bound to fail. 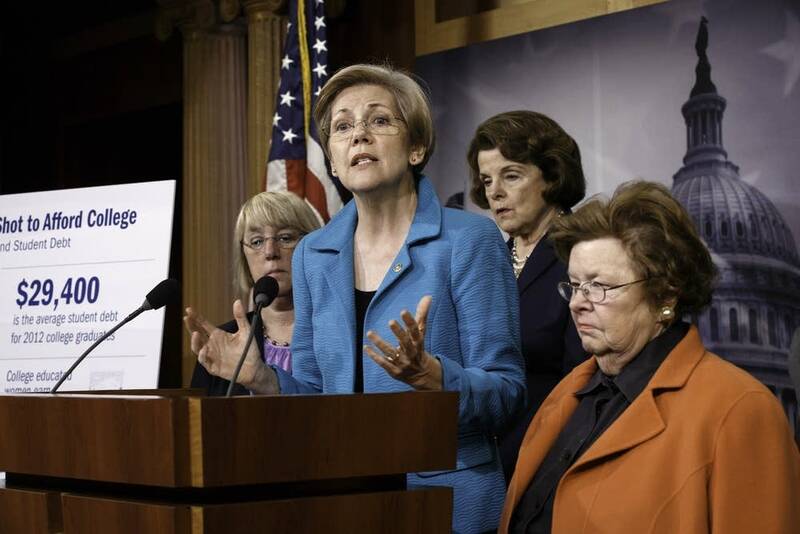 "The Senate Democrats' bill isn't really about students at all. It's really all about Senate Democrats," said Minority Leader Mitch McConnell, R-Ky. "They want an issue to campaign on to save their own hides this November." Student loan debt has topped $1 trillion and emerged as a drag on the economy and on middle-class families across the country, making it a ripe target for politicians ahead of midterm elections where Democrats risk losing their Senate majority. Wednesday's vote followed two days where President Barack Obama highlighted the issue from the White House, announcing executive action to let more borrowers to cap their monthly payments at 10 percent of their income and answering questions about the issue on the social networking site Tumblr. The Obama administration said Warren's bill could have helped some 25 million borrowers save $2,000 each over the lifetime of their loans. It would have allowed people with older loans at higher interest rates refinance to rates below 4 percent offered today under a deal reached a year ago in Congress. Three Republicans joined all Democrats in voting to proceed to debate on the bill: Susan Collins of Maine, Bob Corker of Tennessee and Lisa Murkowski of Alaska. Some 40 million Americans have outstanding student loan debt totaling $1.2 trillion, making it the second-largest form of consumer debt, second only to mortgages, according to Warren's office. People 60 and older account for some $43 billion of outstanding student loan debt.